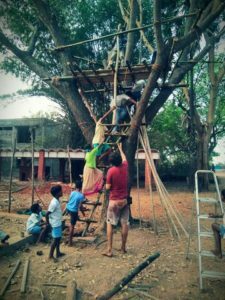 The children at Isai Ambalam have been wanting to build a tree house for some time. 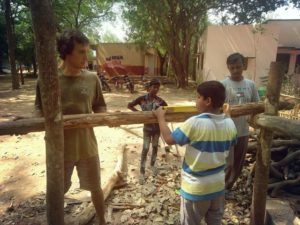 Josh a volunteer who volunteered at STEM land in the past spent some time at Isai Ambalam and had some experience with building tree houses. 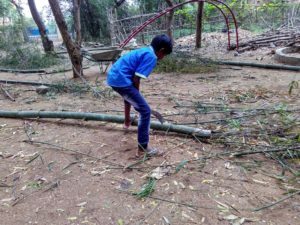 He decided to put in an effort and work with the children to get this done. 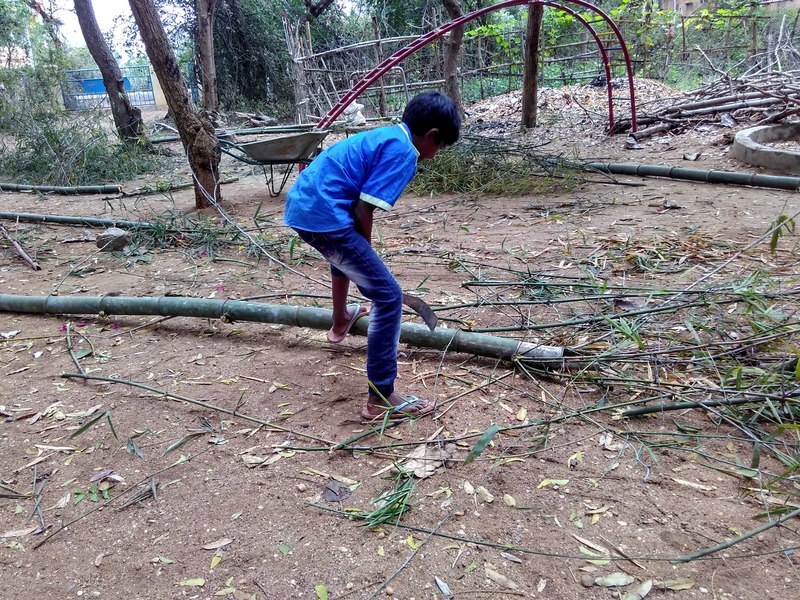 With the help of the children and some very nice tools Josh brought with him the children were able to help him use the bamboo on campus for the main sections of the tree house. 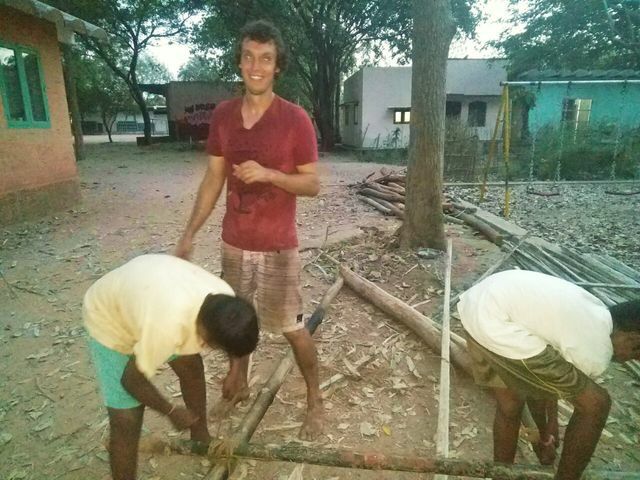 Josh was very impressed at how comfortable and efficient the children at the school are at using tools. 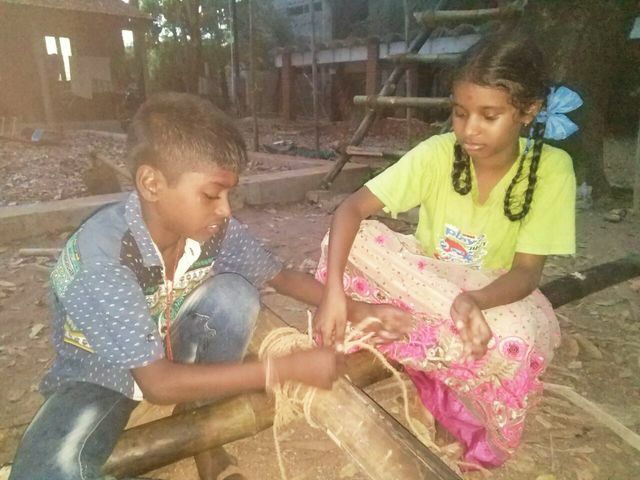 In addition, we needed other materials like Pakku Maram and coconut ropes which we bought from the local shops. 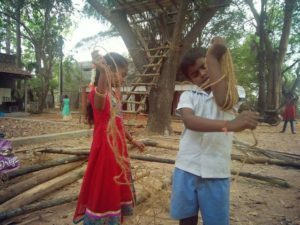 One of the earliest activities that the children got involved with was tying up the coconut ropes into quickly usable bundles. This was Josh way of testing if the children could tie things tightly. 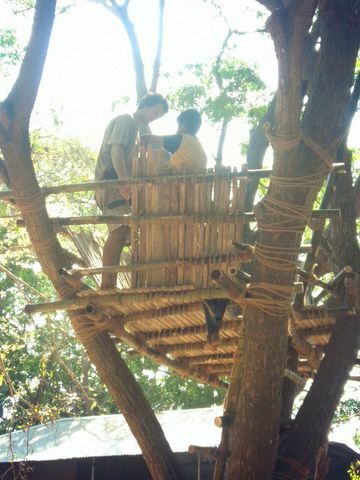 Josh also called the tree house community to help with the core aspects of the tree house so it is robust. 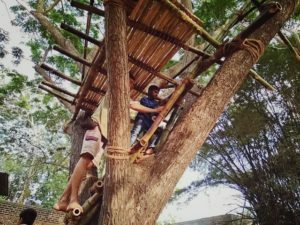 The children were also asked to imagine how they would like the tree house to be once the tree was selected close to the play area. Josh came in on a holiday and worked on seasoning some of the bamboo, by burning it and then applying a combination of cashew oil and diesel which keeps termites away. 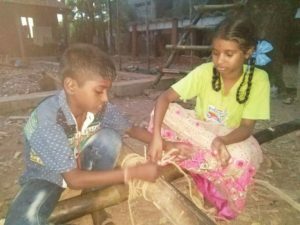 They performed a small pooja at the tree thanking trees for giving us oxygen and supporting life and supporting our Number 54 (the house with a bamboo door) tree house. Josh had also taught the children a song about trees in English and the children sang this song as well. 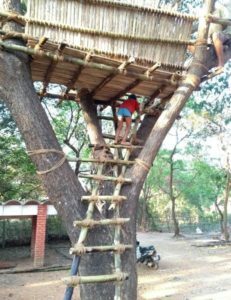 One of the designs was selected in which the ladder went through the floor in one corner and the machaan would be built there. 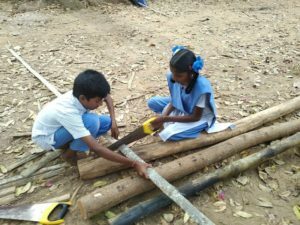 Within the day there was a framework with bamboo supported in one place by a work tree. Tying the rope for the main structure was hard and only the elder children were able to do this initially. Josh then showed the children how to work with the Pakku Maram. They did this over the next couple of days the children measure cut and created a complete platform and a short keep out wall that makes it feel like you are in a boat in the air. 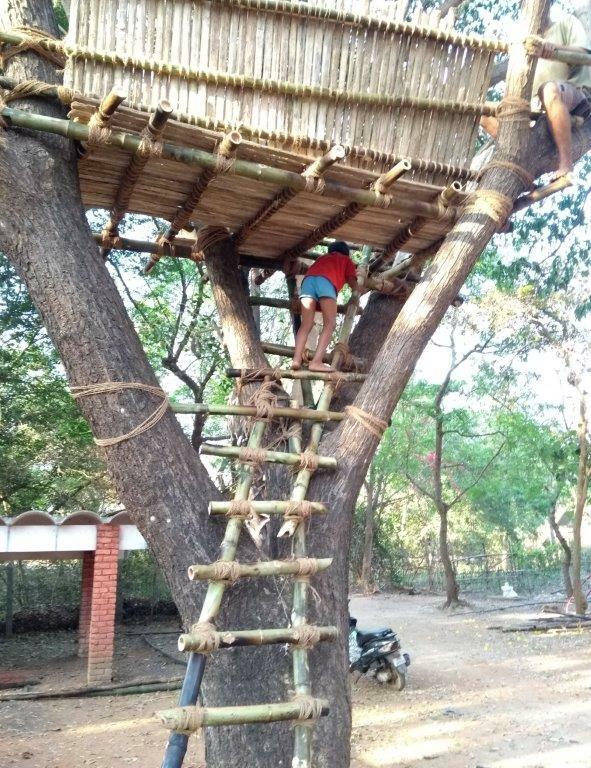 Another major task was making the ladder and the children were involved with this and in making a small structure at a lower height for the younger children to have something to climb on. Of course, it is impossible to keep anyone off the tree house and everyone wants to be on top of it. Initial work on bamboo, cutting to size, Pakku Maram measuring and cutting. Narrow opening to get in and the boat in the air.